The Landmark created within a Timeline …. In a fast moving era, where Women have broken the Grass Ceiling and come out to face the Challenges in an ever transiting society as well as to earn a Living, it is indeed daunting and this happens more and more during the peak time of their Menstrual Cycle. In order to carry on with a Routine life which is free of Natural physical impediments, ADML-ADROIT MOLECULES has come up with a specialized Brand of Sanitary Napkins, which was and is proving to be a relieving remedy for many Juveniles who step into the immediate challenge of BLEEDING SUDDENLY on a Fine morning !! Moreover, this is also the One Stop Solution for many Women suffering from the tantrums of irritating circumstances such as untimely Leakages. Yes …. To make the women feel more and more comfortable during those 3 to 4 Hectic days in a month, ADROIT MOLECULES came up with the “BENEVOLENT” thought of creating an additional edge to the conventional production of Sanitary Napkins which have been in use commercially for the last few decades. 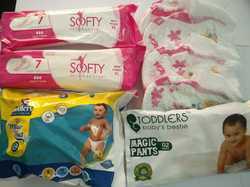 SOFTY has come up with a unique set of Features wherein Women are bound to gain rather feel the irrascible pain of the so called “Period”. Well, How and where is SOFTY creating the specific Niche in the market, is something on which we will focus later but when it comes to ADROIT MOLECULES the question arises whether how to prove really the Brand Name ? Switching on to this parameter, our organization feels proud to assert on the fact that we have created an indelible mark in the domain of manufacturing a specific Brand of Sanitary Napkins which has a unique Quality material. With its’ inception in 2012 and formed under theADROIT MOLECULES has been a Pioneer Supplier of Antibiotics, Analgesics, Antipyretics and Antiseptics as well as a plethora Oral, Dermal and Injectable remedies to various Governmental Sectors, either on Contractual /Tender Basis across the entire gauntlet of the country. These remedies are procured by our organization from different Pharmaceutical companies and later dispatched to the Central and State Government Bodies at a wholesale price who have placed an order for the same.